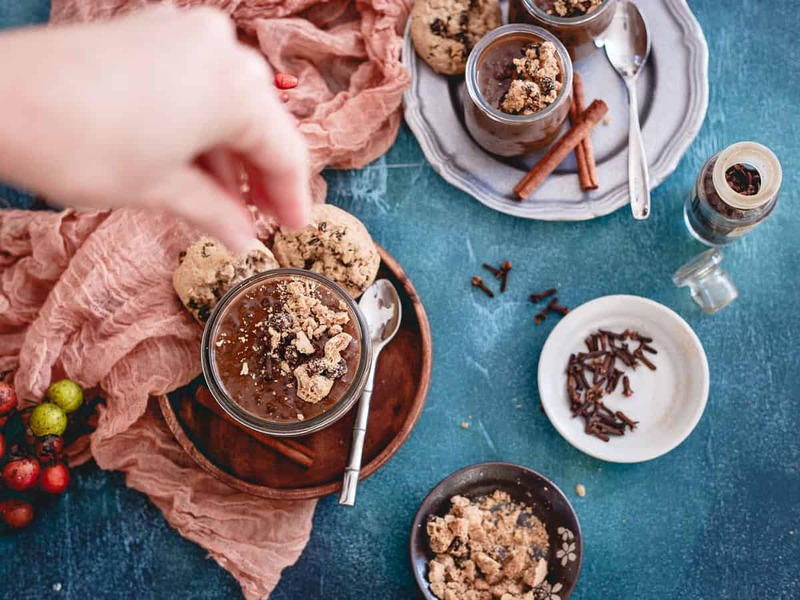 Dirty chai tapioca pudding is topped with gluten-free oatmeal raisin cookie crumble and makes a deliciously aromatic and decadent dessert. Lover or a hater? I feel like people are pretty opinionated on pudding. I love the stuff. That said, I love it on it’s own. I don’t love it in a pie. No, pies are for fruit, not creamy fillings. Nope, nope, nope. Throw things like rice and tapioca in there and people get even more worked up about it. I truly don’t get the tapioca haters. That texture is just FUN! At least I think so. Guess that’s probably why I love chia pudding too (pumpkin chocolate chia pudding or pumpkin pie chia pudding parfaits anyone?). Basically, the more texture, the merrier in my eyes. Or mouth. My mother-in-law is the rice pudding queen. I’ve made it before but don’t do so often (this creamy orange spiked wheatberry pudding is the closest thing to it on here) because hers is really just the best. Except for that one time she made it with salt instead of sugar. It was years ago when we lived in Florida, my brother was visiting and she was so excited to have another mouth to feed. He and Ulysses took the first spoonful and watching my brother’s face transform into disgust while he tried to disguise it for politeness sake was one of the most comical moments of my life. I, thankfully, hadn’t tried my serving yet. She’s redeemed herself since then but that my friends, is why you keep food items in (appropriately) labeled containers. I’ve purchased some obscure ingredients doing this thing called food blogging for the last 6+ years but weirdly, tapioca pearls were never one of them up until recently. With a half opened box of them though this dirty chai tapioca pudding came to be. I feel like this isn’t something I should admit but I had no clue what dirty chai meant up until a few weeks ago. Julie made these brownies and it was like the angels started singing and the heavens opened up. Espresso AND chai combined? Um, yes. I want that combination in drink form, in brownie form, in pudding form and basically any other form it wants to take because YUM. 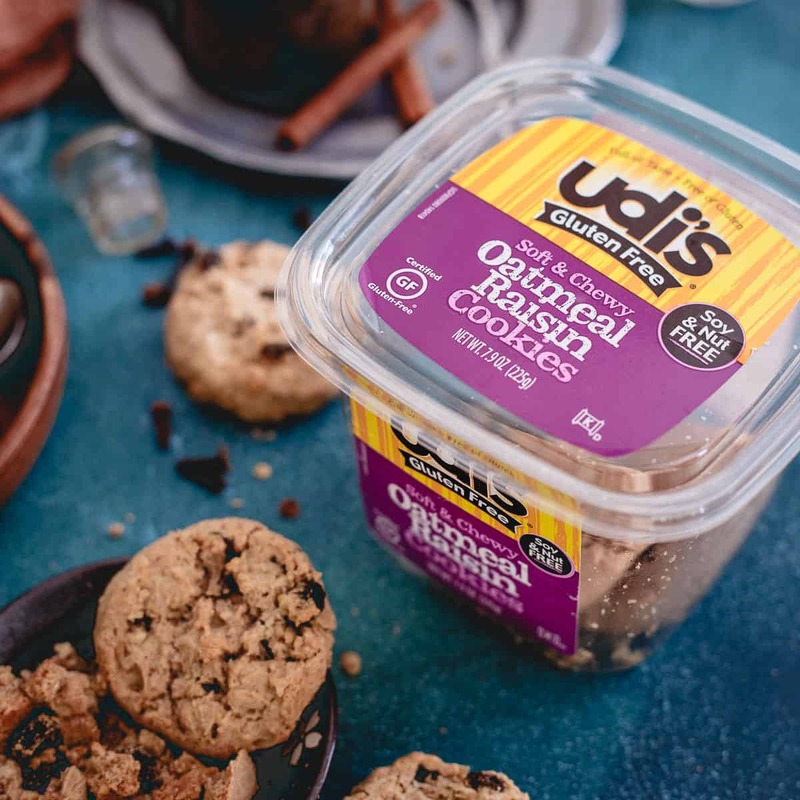 I decided I wanted to take the texture thing even further with this dirty chai tapioca pudding and crumble my favorite Udi’s Gluten Free soft baked cookie on top – oatmeal raisin. Remember these maple cashew chocolate chip cookie milkshakes from back in the summer? Well, I do love those Udi’s cookies too but if you ever give me a choice when it comes to cookies between traditional and soft baked, I’m going soft baked all the way, always. 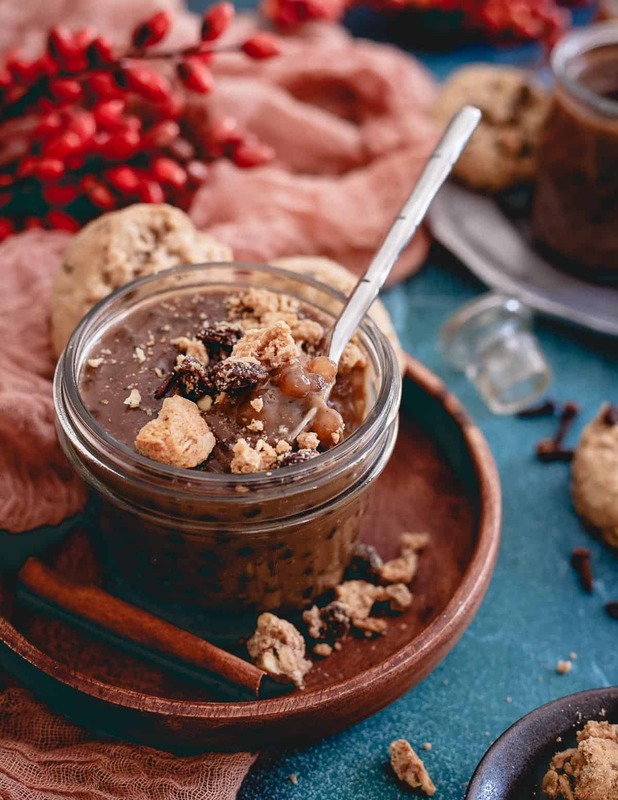 They bring even more fun to each bite of this dirty chai tapioca pudding. It’s equal parts aromatic, coffee buzzed and sweet (it’s also dairy free!) and I think all you pudding lovers (minus the texture weirdos) will love it. Love this Dirty Chai Tapioca Pudding recipe? 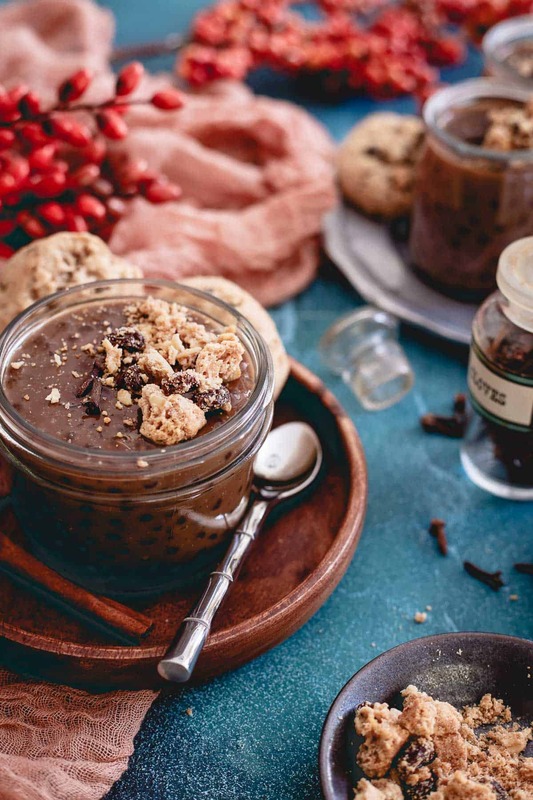 Try these other pudding recipes: Coconut Caramel Coffee Pudding, Blueberry Coconut Chia Pudding, and Chocolate Orange Raw Pudding. Place tapioca pearls in a small bowl, cover with cold water and let soak for at least 1 hour. Drain tapioca and set aside. Place almond/coconut milk in a small pot over medium heat and bring to a simmer. Place chai tea in an infuser and let steep in the pot with the milk over low heat for 5 minutes. Remove tea infuser and discard. Add the brewed espresso, vanilla, maple syrup and salt to the pot, whisk to combine. Add the tapioca pearls, increase heat to medium and stir frequently over a low simmer until pudding thickens and tapioca turns from white to clear, about 20-25 minutes. Pour the pudding mixture into 4 containers. Top each with the cookie crumbles and serve. Alternatively, refrigerate pudding to serve chilled and top with the cookie crumbles before serving. Team pudding over here! Loving all the flavors you added to this pudding and the topping?! So good! Stunning photos, real eye for food photography! I’m thinking this would make for a good breakfast as well. Love that crumble! Dirty chai is one of my favorites, and I could have it any form as well! I typically shy away from pudding, but honestly this sounds too good to pass up! 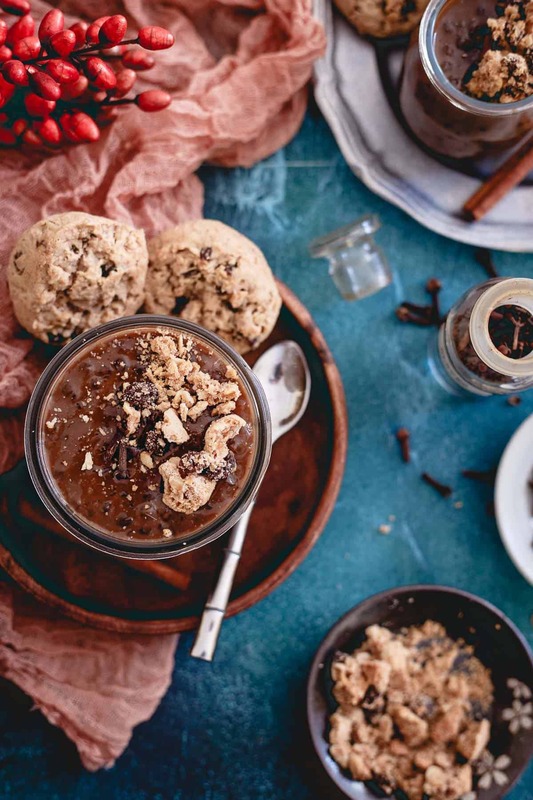 Espresso and chai together is AMAZING and I just love how you infused these flavors into a tapioca pudding!